Learn how to make sushi rice perfectly every time with step-by-step pictures and a video tutorial. All you need is simple ingredients such as sushi vinegar, sugar, salt and kombu. 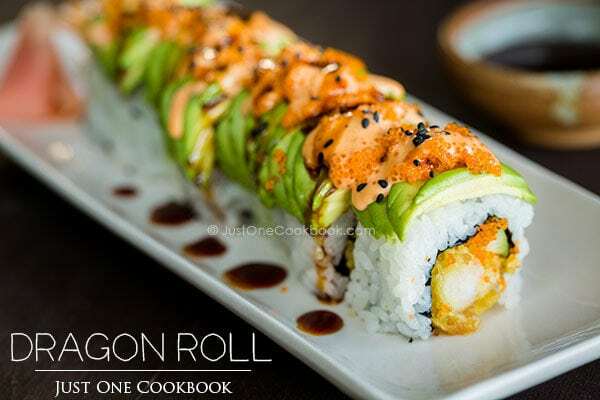 Once you master the secret of making the rice, you will be ready to dish up all kinds of mouth-watering sushi recipes! 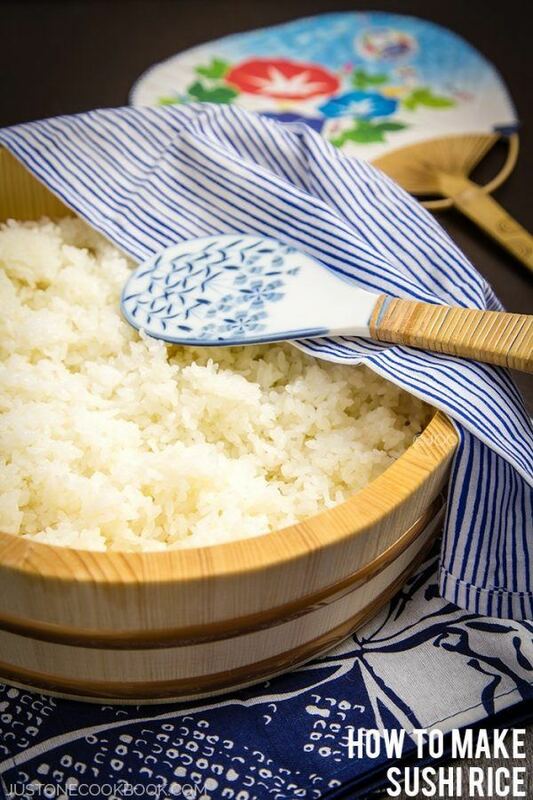 Sushi Rice is steamed rice that’s flavored with vinegar-based seasonings and it’s only used for making sushi. Perfectly cooked sushi rice is fundamental in making authentic sushi. 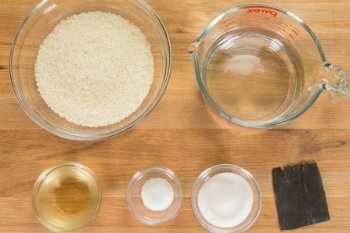 Simple instruction on how to make sushi rice with kombu, rice vinegar, sugar, and salt. In Japan, sushi rice means the steamed rice that’s flavored with vinegar based seasonings and we only use this vinegared rice when we make all kinds of sushi. However, it gets a little tricky because some rice companies outside of Japan call their short grain Japanese rice “sushi rice”. It definitely calls for attention especially if you are planning to make Japanese food, like sushi. So when your sushi recipe says sushi rice, make sure to make “vinegared rice” with short grain Japanese rice. In Japanese we call sushi rice Sushi-meshi 鮨飯, Su-meshi 酢飯, or shari 舎利. 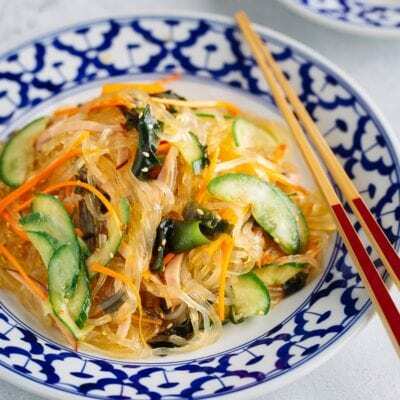 It’s made of white, short-grain Japanese rice seasoned with rice vinegar, sugar, and salt. Brown rice is sometimes used outside of Japan, but it’s not common in sushi restaurants in Japan. – To achieve authentic Japanese standard, you want to use only short-grain Japanese rice to make sushi rice. This is because the consistency and flavor of Japanese rice is very different from long-grain rice, jasmine rice, or other types of rice. With a higher content of moisture, Japanese rice is characterized by its unique stickiness and texture, which attributes to the toothsome bite of authentic sushi (please note that short grain rice is NOT glutinous rice aka “sticky rice”). 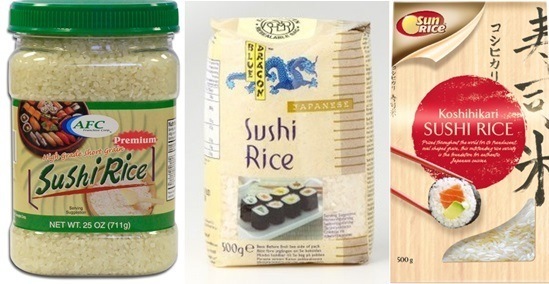 – There are various Japanese rice brands out there available in the market. Some of my favorite ‘first grade’ brands for Japanese rice include Koshihikari from Toyama Prefecture, Japan or Koshihikari from California (see my Pantry page). 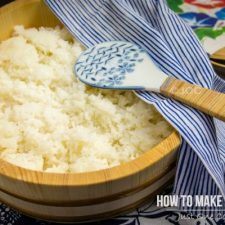 – To produce properly cooked Japanese rice, you want to make sure the rice is washed and rinsed for a few times until no more starch comes out from the water. Then let the rice soaked for at least 30 minutes before cooking. This allows the rice grains to yield a better texture. 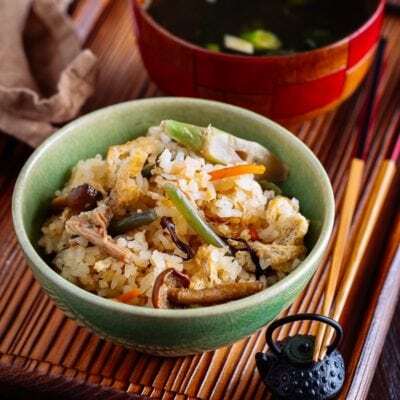 – You can cook the rice using a pot over the stove, but the most convenient way is to cook sushi rice using an electric rice cooker. In my Japanese home kitchen, my trusted rice cooker brand is Zojirushi Rice Cooker. Because I cook sushi rice often, this rice cooker has ‘sushi’ option which makes it really easy to ensure perfectly cooked rice. – The basic seasonings needed for sushi rice includes sushi vinegar, salt and sugar to achieve the balance of sweet, salty and sourish taste. If you can find kombu, I highly recommend adding it to cook with the rice for a more umami flavor. You can use pre-made sushi vinegar or simply make it yourself by combining rice vinegar, sugar, and salt. Why do we season rice with vinegar to make sushi? You might wonder why the Japanese season rice with vinegar. It actually goes back to the origin of sushi. The literal meaning of sushi means “sour flavor”. Historically, the way people stored fish was by wrapping it in fermented rice. When they were ready to enjoy the fish, the fermented rice was actually tossed away. Some time between 1300 – 1500’s, the Japanese slowly stopped using fermented rice and instead added vinegar to the rice to further increase the shelf life. The vinegar made the rice taste good as well so they started to eat the fish and the rice together, which evolved to today’s sushi. These days with refrigeration there is no longer the issue of fish being spoiled, but the centuries of sushi rice’s umami flavor with the vinegar being added stayed. HOW TO TELL IF YOUR SUSHI RICE IS PERFECTLY COOKED? 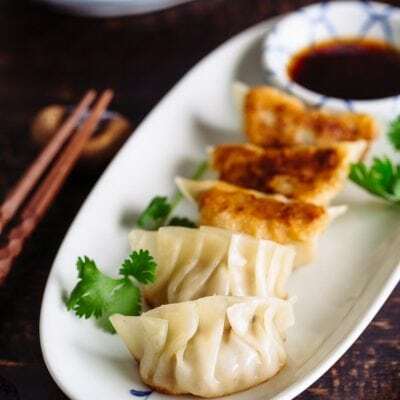 – After the rice is steamed, the texture should be fluffy with a firm bite. 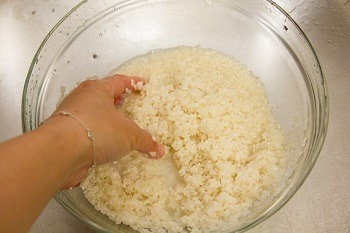 And each rice grain should be sticky yet retain its shape. Mushy rice means it has too much water or it’s overcooked. If the rice is fresh, you will see a nice shiny gloss on surface the surface of each grain. 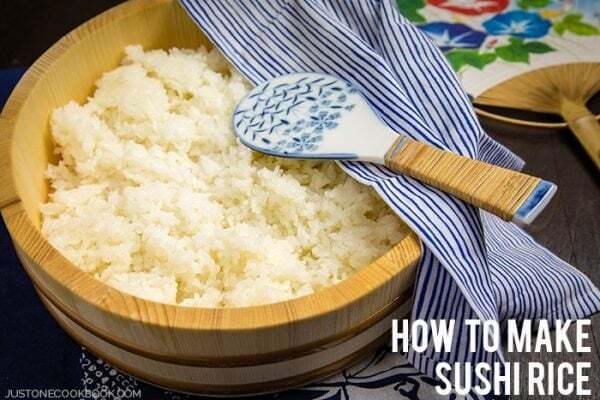 There you have it – the basics of making sushi rice perfectly! Once you get the rice right, you’ll be ready to make some delicious sushi recipes. Learn how to make sushi rice perfectly every time with step-by-step pictures and a video tutorial. All you need is simple ingredients such as sushi vinegar, sugar, salt and dashi kombu. 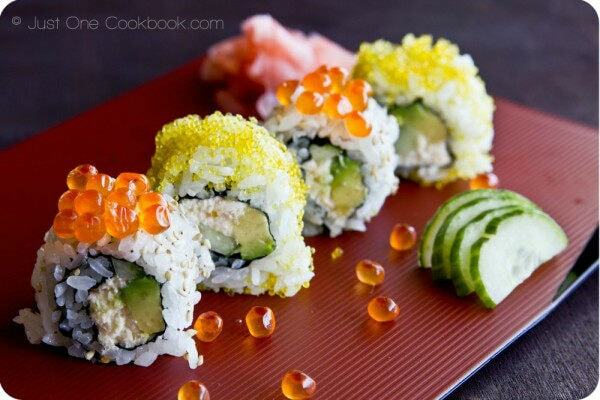 Once you master the secret of making the rice, you will be ready to dish up all kinds of mouth-watering sushi recipes! Please note: 1 rice cooker cup is 180 ml. So when you use Japanese rice cooker, 1 cup means Japanese rice cooker cup. Put rice in a large bowl. Rinse the rice and discard the water immediately. Rice absorbs water very quickly when you start washing, so don't let the rice absorb the unclear water. Repeat this process 1-2 times. Now use your fingers to gently wash the rice by moving in a circular motion. Rinse and discard water. Repeat this process 3-4 times. Let the rice soak in water for 30 minutes. 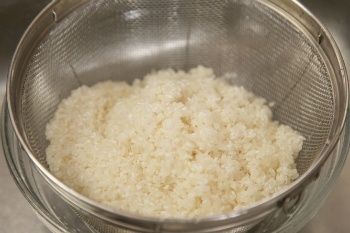 Transfer the rice into a sieve and drain completely. 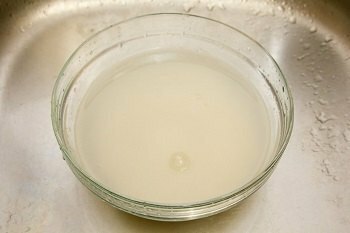 Gently clean the dashi kombu with a damp cloth but leave the white powdery substances which contribute to the umami flavor in dashi. Do not wash the kombu. Put the rice in the rice cooker bowl and add water (not hot or warm) to just under the 3 cup line. If your rice cooker has "Sushi" option, add water to 3 cup line for "Sushi". Since you add sushi vinegar to the rice, rice is on the firm side. If you cook rice without a rice cooker, water should be about 540 ml. Place the kombu on top of the rice and start cooking. To make sushi vinegar, combine rice vinegar, sugar, and salt in a small saucepan and bring it to a boil over medium high heat. 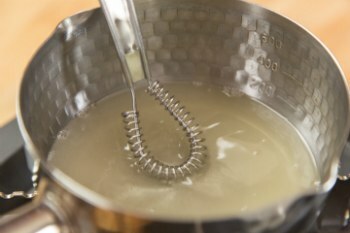 Whisk until the sugar is completely dissolved. 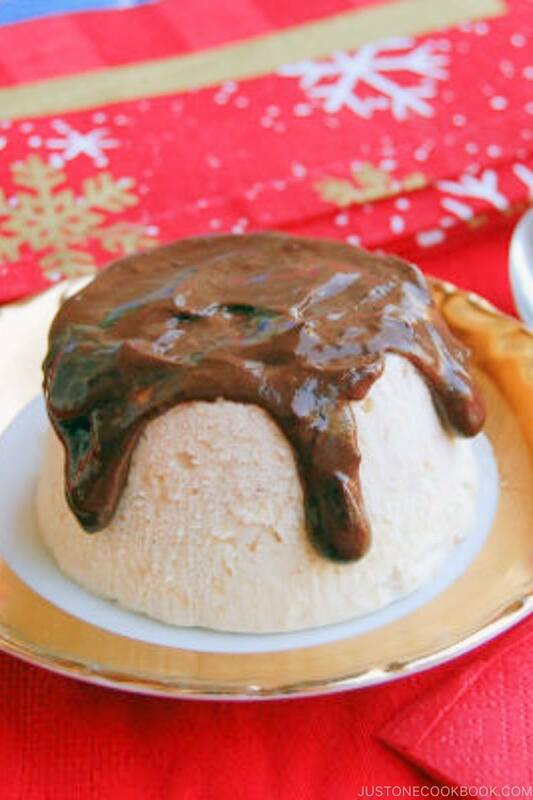 You can also put the ingredients in a microwave-safe bowl and microwave for 1 minute, or till sugar is dissolved. Set aside to let it cool. When the rice is cooked, moisten sushi oke/hangiri (a round, flat-bottom wooden tub) or a large bowl with water so the rice will not stick. Transfer the cooked rice into the sushi oke and spread out evenly so the rice will cool faster. While it’s hot, pour sushi vinegar over the rice. With a rice paddle, slice the rice at a 45 degree to separate the rice grains instead of mixing. At the same time you need to use a fan to cool rice so the rice will shine and doesn't get mushy. Then gently flip the rice in between slices. Repeat this process till rice is cooled. 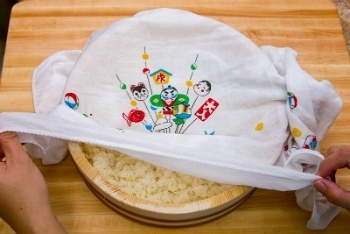 Keep the rice covered with a damp towel (or paper towel) until ready to use. Rice: 1 rice cooker cup is 180 ml, not same as 1 US cup. 1 cup will make 2 cups of cooked rice. Please use short grain rice for sushi. Want to make less sushi rice? 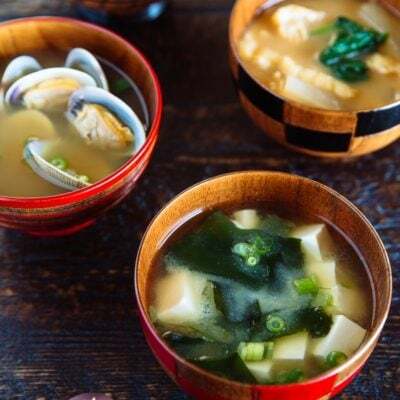 If you want to use 2 rice cooker cups (360 ml) instead of 3 cups, you can adjust sushi vinegar ingredients as following: 4 Tbsp rice vinegar, 2 Tbsp sugar, and 1 tsp kosher salt. Sushi Vinegar: There is a convenient Sushi Seasoning available at Japanese/Asian grocery store. 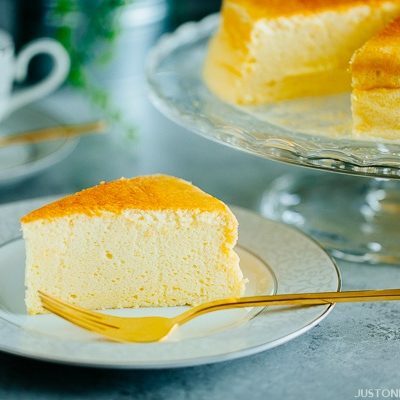 rice cooker - If you don't have a rice cooker, please follow How To Make Steamed Rice (in a pot). 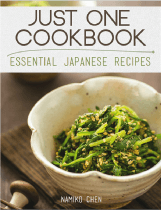 Editor’s Note: How To Make Sushi tutorial video is added in November 2014. Such a helpful and important post! Great job! That is a wonderful post Nami..making Japanese rice is an art form! Thank you for sharing this. I love Japanese rice but why they got too be so expensive ? Haha can’t wait for tomorrow post. Excellent and informative post. Thanks for showing me exactly how rice should be cleaned and how to cook a perfect bowl of sushi rice. I love your rice bowl too! Thanks for posting this! The rice is such an integral part of sushi. I have never made it at home but took a class a couple of years ago. It was so much fun! Oooooo…. can’t wait until tomorrow! Thanks for sharing the tricks of the trade with sushi rice! oh how fun! i love this post:) thank you for sharing this i have this book marked already!! These are very helpful tips. Thanks! Ohhh so the name is Hangiri! Now… where can I find a japanese rice? Hmmm… there will be a label “japanese rice” rice right on the brand? Over here, we can find pretty good quality of Japanese rice (Koshihikari or Akitakomachi brand are the best) in Chinese and Japanese markets. There are some brand of Japanese rice at American supermarkets too but quality is not good enough for Japanese people who grew up with really delicious Japanese rice. Anyway…I hope you can find it in your supermarket! I love the hangiri! And rice that good looking will make delicious sushi. 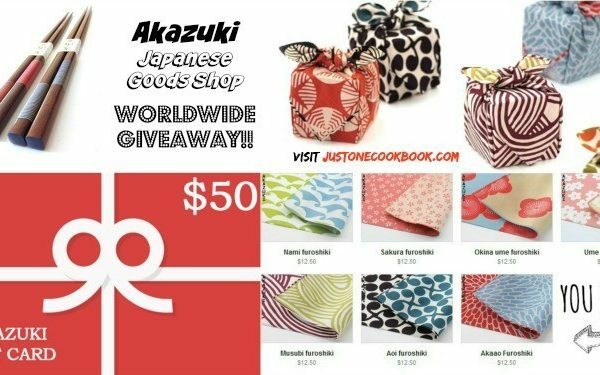 Any chance you’ll ever do a recipe for making onigiri? Thanks Nami! We love sushi rice. what a helpful post for those wanting to make sushi at home. I tried to do it once and it was a disaster! lol! Do you believe that I don’t have a rice cooker?! I have every gadget and appliance that you can think of in that kitchen, but I don’t have a rice cooker… sigh. Awesome! My BF has been promising to make me onigiri lol.. I have not seen any onigiri yet! I’m going to fwd him this link to remind him that he owes me some! Ooh I’m excited about tomorrow!! This is perfect timing because I’m doing a roll your own sushi party soon. Thanks Nami and thanks for the recent advice. I can always count on you to give me honest feedback. I have only ever made sushi rice once before with my hubby and my brother when we did an evening of sushi at home – it was great fun. Tell me does the vessel in which you mix the rice needs to be wooden, does it effects the final result? Nami, this is an excellent idea! I see now I still have so much to learn about sushi rice. Ok, so I rinse the rice 3 times (I have noticed it tastes better and has a better texture if I rinse it in warm water, is it normal??? Am I committing a sacrilege?). I have never cooked konbu with it! Instead of sugar I usually put sake and mirin (is it weird???). I must try cooking it with konbu next time. Thank you, Nami. As always, you are a great teacher! The damp towel is so kawaii!!!!! I love it. Hi Sissi! It’s known in Japan that we are not supposed to wash in warm water (but I cheat in cold winter time and wash with luke warm water). I search a bit and I found some article saying it’s okay as long as temp is 30-40C. Maybe that could be just one theory. When you wash rice in warm/hot water, starch from rice starts to gelatinize. So we need to wash with cold water. Also, make sure to add (cold) water in rice cooker. Rice cooker will shorten cooking time when you put warm water (smart huh), and inside of rice may not fully cooked. I’ll add this info in How To Page later. Thanks for asking! What a fantastic blog, I just found you by chance. I’m Sicilian but my husband is Japanese and we live in Sicily. I love Japanese food but of course I don’t know how to cook it as well as you. I’m sure I can learn a lot from you. I’m going to tell my daughter (hungrycaramella.blogspot.com) to follow you too, she loves Japanese food. I’m following you from Rome, we’re here on holiday. Is there any other dish where we can use sushi rice. We have like a packet and don’t know what to do with it. Kankana, “sushi rice” is vinegar-flavored cooked rice and you have to make that especially for sushi. We don’t use regular steamed rice for sushi. I think you meant you have a package of Japanese rice? Nice and informative post, Nami! I love how you get the basics down :o) I didn’t use kombu in my sushi rice until recently, it really makes a difference! This is a very helpful post. I love all the information! I love sushi rice the mild sweet and sour taste makes it so pleasant for the taste buds. I can’t wait until tomorrow then! Sushi is quite literally my favorite food! Thanks for the tips on the rice Nami! I love the way you show all the steps in your tutorials. Even for the basic staples like sushi rice. It’s such a good reference for us. Awesome post Nami, I love the step by step instructions, so helpful..I never made sushi, and I love eating it so much. I have all the ingredients but somehow always ending up buying freshly made in front of me. Thanks for this post!!! Aww I remember doing this with my grandma! I was the fanner and the roll ingredient person and she would roll them. Excellent how to Nami! Yay! What a great post idea…I cannot eat seafood, but I love sticky sushi rice…. Such a great post! I appreciate your instructions and your photos! I never quite do this right, so thank you!! I’ve been putting off sushi for so long in fear of utter failure- this reminds me I need to step up and give it a go! Thanks for the wonderfully informational post. Fascinating! This is so different from making basmati rice the Persian way. My mother-in-law is even on the rice cooker band wagon, but I love making it the old-fashioned way, with a pot. Maybe it’s because my cupboards are full and I have no room for another kitchen gadget?! Great lesson – thank you! 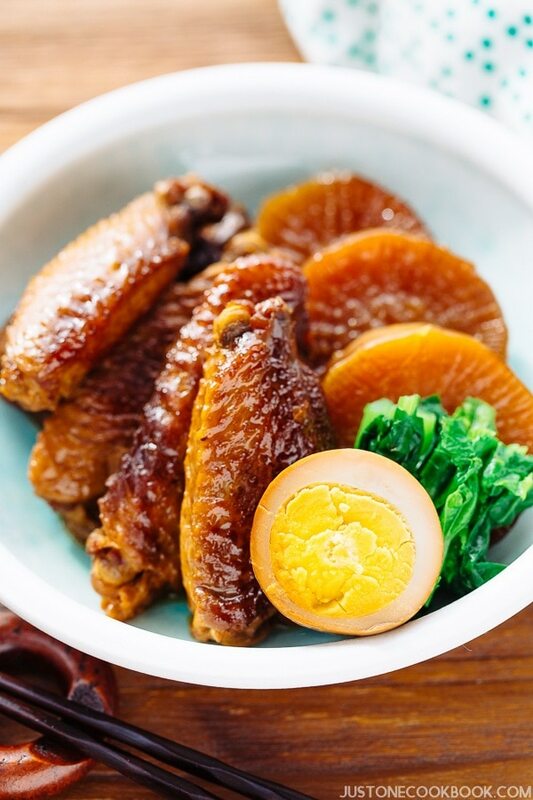 We are lucky in Sydney because there are so many great Japanese restaurants and famous Japanese chefs (Tetsuya Wakuda being the most one of the most celebrated chefs in Australia) and we have a fantastic variety of Japanese food to choose from. Ciao Alessandra! You made me think about sugar in Japanese food. I agree – we use sugar or mirin in our seasoning all the time. But then I never thought Japanese sweets are as sweet as American sweets…maybe that’s our compromise there. haha. 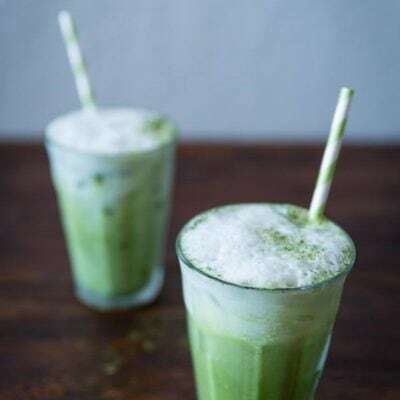 Adding konbu is pretty common or I think everyone does….some people use Konbucha (kobucha) instead. It gives nice aroma and taste. You will love it! I always make a generic version of sushi rice – but now I know how to properly do it thanks to you Nami! Thanks for this awesome tutorial, Nami! I’m pretty sure this will be of help to me one of these days! Love that you shared this link.Such posts on basics are always a keeper.Thanks so much for sharing! My husband would be a super happy camper if I made Sushi. I’d be a super happy camper if I were your neighbor and you brought some over. I love this post! My husband and I love making sushi at home and now that I know how to make the perfect rice I see some sushi in our future! Hi Nami-Your California rolls are the most beautiful, and perfect rolls I have ever seen. No wonder you made the #1 spot on Top 9. Congratulations, by sweet friend…well deserved! I will look into the instructions later…have never made sushi, but my son-in-law is an expert, and he even makes it at his Italian restaurant, as well! Thanks so much for your kind care and concern…I’m starting to be able to move, and even lift my arm, better! 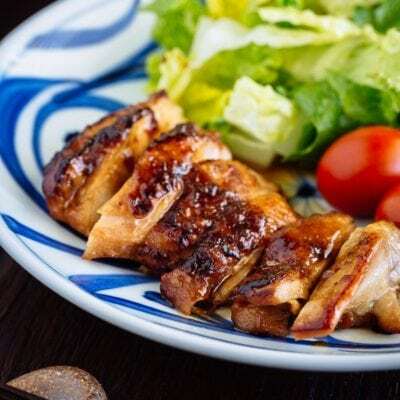 Nami, you are currently among the top 10 in TOP 100 FOOD MOM BLOGS, 2011! I hope you win! hi nami, nice to know your blog. I want to learn to make sushi, i have this idea of making it to some friends next week..not sure if i have time to do that. Would like to know besides a hangiri, can we transfer that cooked rice to a container instead? also i have no microwave, what can i do about that? is it alright not to microvave that seasoning? Thanks! Hi Lena! It’s nice to have a hangiri, but of course you can make sushi rice without it. Try to use a large opening bowl so that rice will quickly cool off (and evaporate moisture) while you are mixing the sushi seasoning. The microwave method is a shortcut method. You want to make sure sugar is completely dissolved, so just use a small saucepan over stove top. 🙂 Enjoy making sushi! It’s likely a little unconventional, but I usually season the kids’ rice with vinegar. They love the sour flavor, especially when I serve it with a stir fry for them. 🙂 Now you have me craving sushi too! What a useful post! Making sushi rice is something I’ve never attempted — didn’t even know how to begin. But now I do! Terrific recipe — thanks. We love sushi rice, especially when eaten with sashimi…or chirashi sushi. I cook Japanese short-grain rice even if I’m not making sushi cause it’s a very good side dish when served with something with delicate flavours which I want to savour. Now I have a craving for inari sushi or onigiri. What an awesome post, though I am beyond scared of trying sushi at home! I cook Japanese short-grain rice even if I’m not making sushi cause it’s a very good side dish when served with something with delicate flavours which I want to savour. Now I have a craving for inari sushi or onigiri. We love sushi rice here at home. My son can eat it just like that with nothing else. 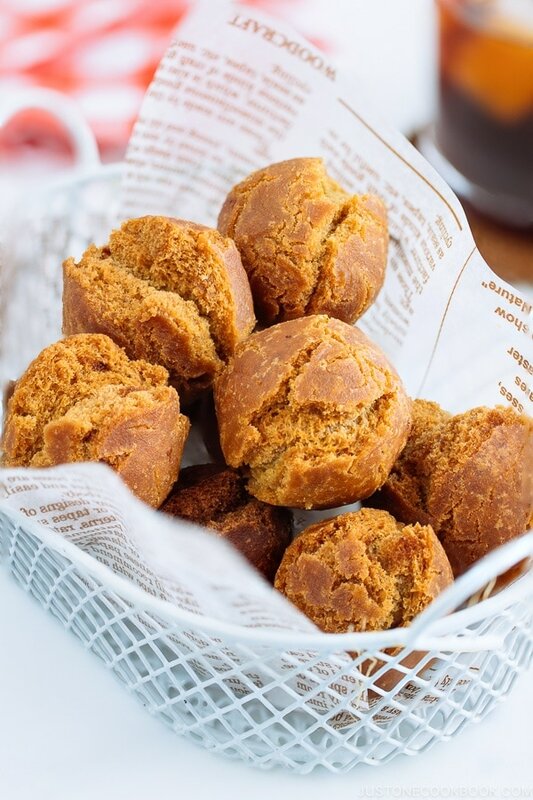 You just inspired me to make some again using your recipe. I love your wooden rice bowl and paddle. Is that from Japan? It’s gorgeous. Thanks for sharing, Nami. I hope you’re feeling better. Take care. My husband and I are eating out this weekend. I want to have a night off from cleaning kitchen. Sushi sounds really good! Hope you’re feeling better, Nami. Sushi rice…I didn’t even realize there was a sushi rice! 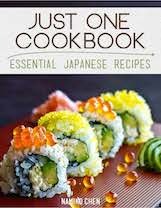 I’m paying attention, as I want to put together a sushi recipe I recently came by and this is most timely for me. 🙂 Have a good rest of the week and get better! A great post. Very informative and helpful. Such an informative post, I love reading about how different cultures preserved food. I remember being surprised at the process of making rice for sushi the first time I prepared some. But good rice and the steps are well worth the effort. what a really helpfull info Nami!!! 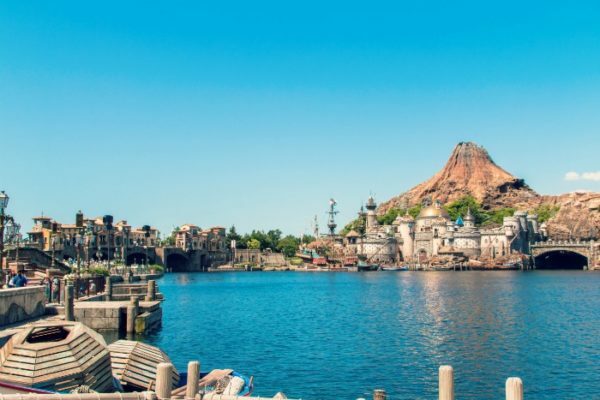 Nami, your blog is beautiful! This is my first visit but it won’t be my last, I can’t wait to make some awesome authentic Japanese food! Nami that’s a wonderful and very useful idea. Nami-san, great little video of how to make sushi rice. I love eating sushi rice fresh out of the bowl, even before I make onigiri or any rolls. I just love that sour taste. You are inspiring me to crack out the bento boxes this week for the kids lunches. I only made sushi rice once but forgot the konbu. Need to make it again by follow your authentic recipe! 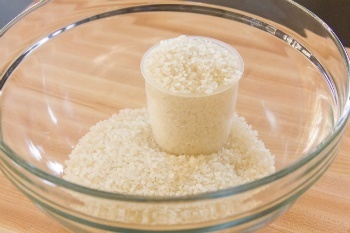 generic guideline is to use 3 cups of water for 2 cups of uncooked rice when cooking the brown rice in the rice cooker. What adjustments to your recipe must be made if medium grain brown rice is substituted for the white rice used in your recipe? Thanks in advance for answering my inquiry. Hi Edwin! I wish I can answer to your question, but I don’t use brown rice and I am not sure about the measurement. 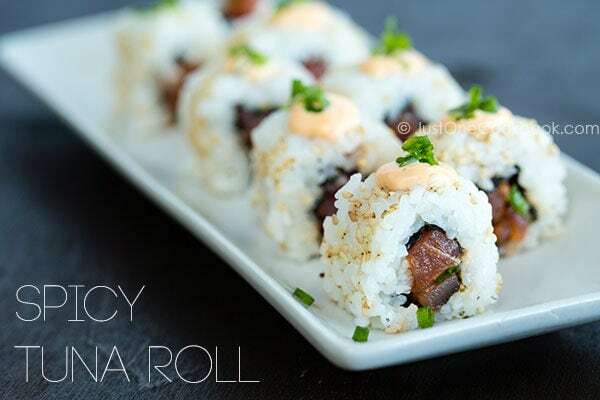 However, I’ve seen many brown rice sushi rolls before and it should work just fine. Please try experimenting with more water (so at least it’s edible) and reduce the water as you try to find the correct measurement. I’m sorry, I wish I could help! It’s the first time I see such an exhaustive post about sushi rice. Congratulations for the video!!! Hi Nami, i just made the sushi rice and its really the best, and you’re true! the rice brings the entire taste of sushi. Great guide, I didn’t know about the fermented rice in the history of sushi. my wife makes sushi for a living and I can tell you they don’t use sushi short grain rice.They use medium grain rice because the sushi rice tends to fall to pieces where as the medium rice doesn’t. it’s just a matter of using the correct proportion of sushi vinegar in the rice and cooking the rice correctly, it’s a matter of practice makes perfect. Hi Lizhen! Thanks for sharing your tip! I’ve never used medium grain rice, it’s good to know it has similar texture as short grain rice as long grain rice never has the same stickiness. Thank you! Good Afternoon and thank you for the care that you bring with your recipes. Stickt rice is wonderful but I’m trying to make it again and again in my Instant Pot which I love. I can’t quite bring sticky rice and Pot together. Advice? thankyou very much. How do you gently clean the dashi kombu with a damp cloth but leave the white powdery substances? Does it mean to wipe only the parts that aren’t white. 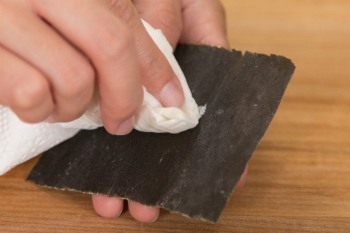 I use kombu quite frequent and am always confused how to clean the kombu correctly for fear of wiping the umami away instead. What if you don’t wipe the kombu at all? Another question. 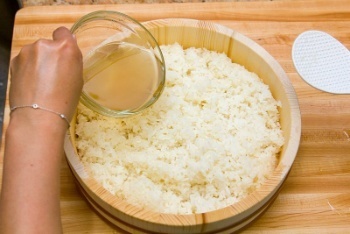 I was told that before mixing the sushi-rice-to-be with sushi vinegar, the rice should be transferred only into either a wooden or glass bowl. Is that true? If yes, for what reason. Hi Shuni! Don’t rub off (that’s what I mean by gently). Most of kombu is pretty clean, but they are dried and packaged in factory after dried outdoor, you want to double check if they are “clean” for you to cook in water. So just carefully look, and brush off or dab off any dirty particles with damp towel (you can use dry towel too, but commonly use damp towel). Regarding to my first question, I really can’t differentiate between dab and that whitish powder. I end up not wiping at all. Regarding to my second question, I’m sorry I didn’t express it clear enough. What’s in question is not why transfer, but why must it be a WOODEN or `GLASS bowl? Is that true? Hi Shuni. If you can see any dust etc, then just dab with damp towel, or blow it off. Never white off the white powder because that’s not what we’re getting rid of. Usually it’s pretty clean (compared to generations ago – maybe). You don’t have to use a wooden bowl (sushi oke) as not everyone has that. Any large bowl or plate that can keep air in and out to cool down will help. The trick is to cool faster (so that you don’t have to keep mixing to cool – then rice gets mushy). Hi Hilary! If you use store bought sushi seasonings and want to be accurate on the amount, the instruction is on the label as each brand has different taste and specify how much is needed. However, in general, you will need to sprinkle the seasonings and the rice should be moisten AND seasoned, but not wet that you can see the liquid… for this recipe, 100 ml to start maybe? Can I use the Nishiki rice brand to prepare sushi or to accompany Japanese dishes (such as curry)? Is it a good quality brand? Hi Noemi! Thank you for reading my blog and watching my videos! I personally don’t use it because I have other better options in my local Japanese grocery stores. I know that that’s kind of a bigger brand in American or Asian grocery store, but the quality is not as good. I still encourage to use Japanese short grain rice for Japanese dishes (sushi and curry like you mentioned) though, compared to other Asian varieties. 🙂 . Hope this helps! I have been getting into Japanese cooking for a little while and I have come to a realization recently which you verify here. As you have mentioned the rice cooker cup is 180 ml and an Imperial cup is 240 ml. I also confirmed my rice cooker cup is 180 ml. A quick google also confirms what is called a “Japanese Cup” is also 180 ml. Armed with this information, this has led to some confusion on my part. So in your experience, does that mean when a random Japanese recipe online all of a sudden states “Cup” for something other than rice; are they referring to the Japanese or Imperial cup? It could make or break a recipe and I appreciate that you specify the corresponding ml amount; most sites do not. Hi Neil! Japanese RICE COOKER cup is 180 ml. We count as 1 go, 2 go, 3 go (1 cup, 2 cups, 3 cups). And now, it gets even more confusing. In Japan 1 cup (measuring cup) is 200 ml! So if you’re using Japanese recipes online or cookbooks, you have to remember 1 cup = 200 ml. On my blog, majority of my readers are from the U.S., so I use American measuring cup. 1 cup = 240 ml. BUT for rice cooker recipes, I specify saying “rice cooker cup” in my recipes. I mentioned this in my FAQ page. Hope this helps! Hi there, I have an Instant Pot with a rice setting on it. Would that work ok? Or would you recommend any adjustments? 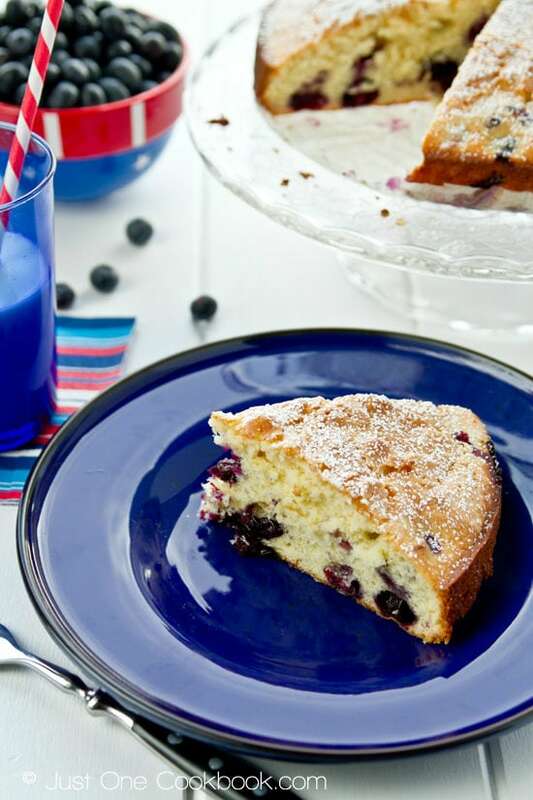 Thank you for your lovely recipes! Hi Elana! 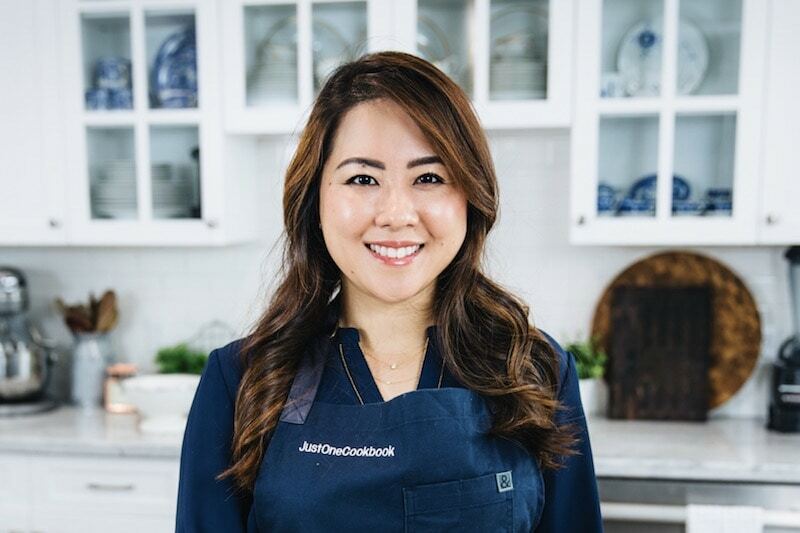 I have an Instant Pot too, but I had enough feedback from my readers that I’m hesitant to try, so I had never used it. Most of feedback I’ve heard is that rice (especially short grain Japanese rice) sticks to the bottom of the pot. I do not want to waste any rice, so I love cooking my rice in my non-stick rice pot in the rice cooker. Sorry I can’t help you with rice recipe for Instant Pot…. How do you freeze your sushi rice? Do you defrost the frozen sushi rice in the refrigerator? And serve it cold? I’m not sure if you’re fan of microwave, but you can microwave it. Usually sushi rice is at room temperature, so either cool it down or don’t microwave for a long time. Hope this helps! Hello Nami and fellow foodies! I recalled seeing a recipe on sushi rice mixed with smoked salmon and cucumber somewhere on the bog. Looked through everything related to rice and cucumber but am still unable to find the recipe. Does Nami or anyone else have any idea what is the recipe name? Hi Peiting! So sorry for my late response (due to traveling…). I don’t have a sushi recipe with smoke salmon, but with salmon sashimi, and here are recipes with salmon and cucumber that I can think of. Hi Nami-San. Where did you get that blue and white porcelain shamoji? It’s beautiful! Thanks for all your hard work. 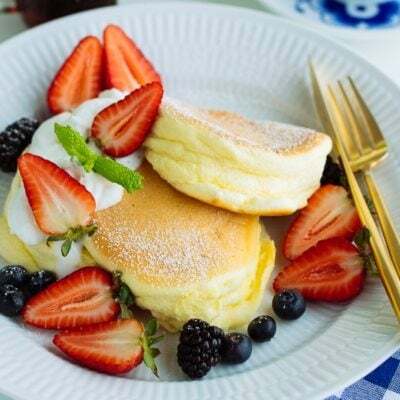 I often turn to your recipes because although I’m first generation Japanese I didn’t learn to read and write Japanese well so it’s great to use your recipes to make foods my mom used to make. Gambatte! Can this be kept overnight? There are two days in a row that I’m planning to make sushi and I’d like it to be a quicker process. If I make extra sushi vinegar, how long will it last in the refrigerator?